Moritaka Mashiro (Takeru Sato) doesn't want to follow in the path of his uncle who worked as a manga artist, but ultimately died because of exhaustion. Moritaka Mashiro figures he will graduate from school and work at an office. Things change though when falls in love with a girl at school. The girl, who hopes to become a voice actress, tells Moritaka they can marry, but only after they both achieve their dreams. 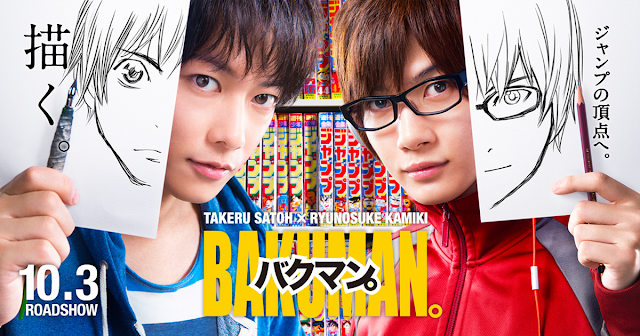 Moritaka then teams up with fellow classmate Akito Takagi (Ryunosuke Kamiki) to publish their first manga. The manga series ran in Weekly Shonen Jump from 2008 to 2011 and was a huge hit worldwide. It spawned its own anime series (2 seasons long) and video game. Now the folks in the Japanese film industry have brought our mangaka heroes to life in a live action comedy-romance-drama film. The film is heavily influenced by the original creators of the series. Takeshi Obata (artist of the manga series) emphasised that he is not just credited as a creator of the film's concept, but also as a staff member directly involved in the production. His own art will appear in the film as the various manga that Moritaka draws. The movie is set for Japanese release on October 3rd.